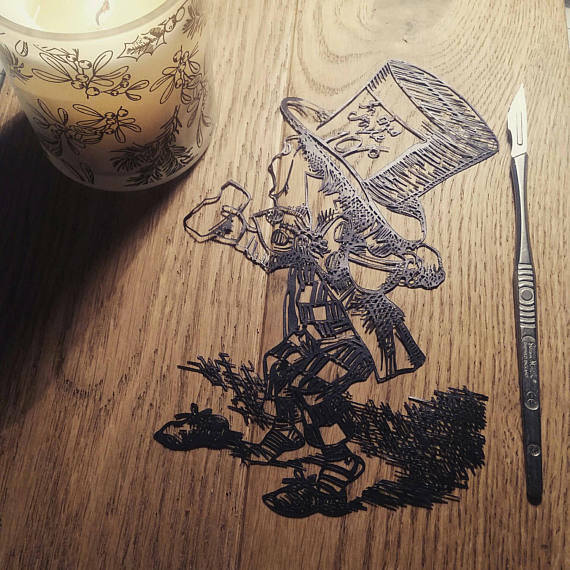 The Mad Hatter is a papercut of the John Tenniels illustration as printed in the original publications of Alice’s Adventures in Wonderland. This framed papercut has been hand cut with a scalpel from a single sheet of high quality black paper. 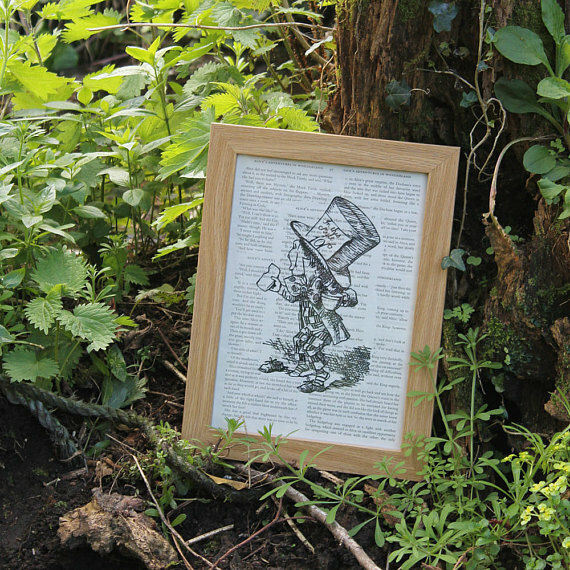 Then framed over pages from a vintage publication of Alice’s Adventures in Wonderland. I never like to put a good book down, either when reading or for art and only use pages from damaged books. This frame comes ready to hang and is approximately 9 inches by 12 inches (23cm by 30cm). This piece can also be cut from white and framed over a plain background, or in different sizes. As can any other of Tenniels illustrations from Alice’s Adventures in Wonderland please get in touch to discuss other options. Hello, I’m Lottie, I’m a paper artist based in Worcestershire. All of my artwork is made by hand from paper, as well as flat lay papercuts I also create 3D sculptures. I realised through my work I was cutting up a lot of trees! So I have started to work with a lot of vintage upcycled paper such as old maps or books, and combine those with tree free papers, these are papers made from cotton or bamboo which is much more sustainable. All items will be sent first class within 7 working days. I gladly accept cancellations within 12 hours of purchase. Please get in touch to discuss returns or exchanges, unless otherwise arranged buyer is responsible for return postage. I do not accept returns or exchanges on custom items. All purchases are subject to UK laws.